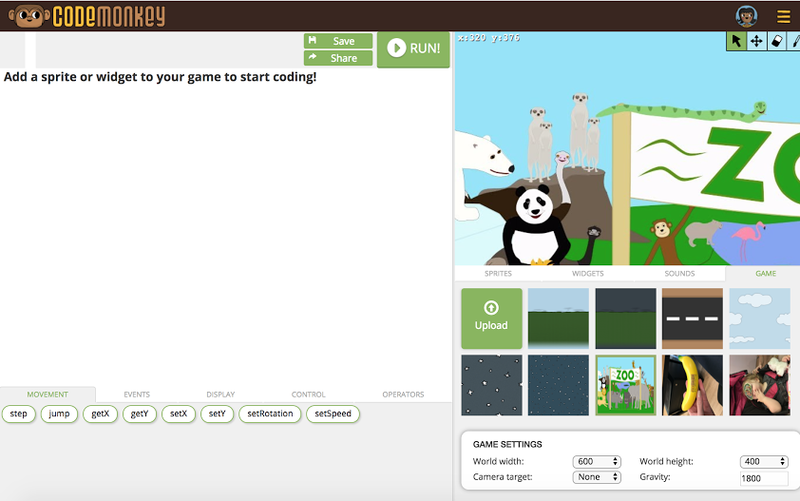 We have added a NEW feature for the Game Builder platform. Now you can get even more creative with your designs! 1. 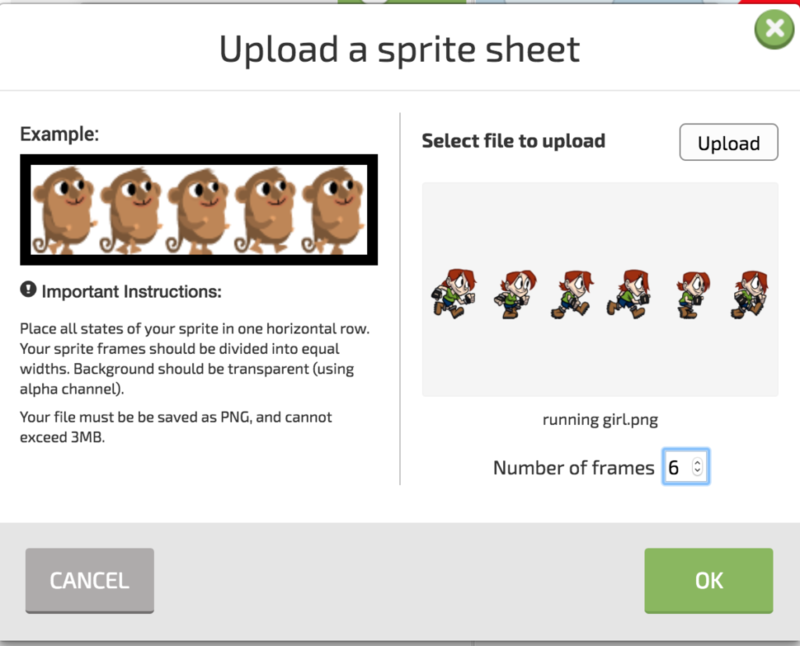 You can upload your own sprite sheet and set it as your animated sprite. To do this, click on Create Games –> the Plus sign –> and then on Your Sprite Sheets. There, you will see the option to “upload sprite sheet”. 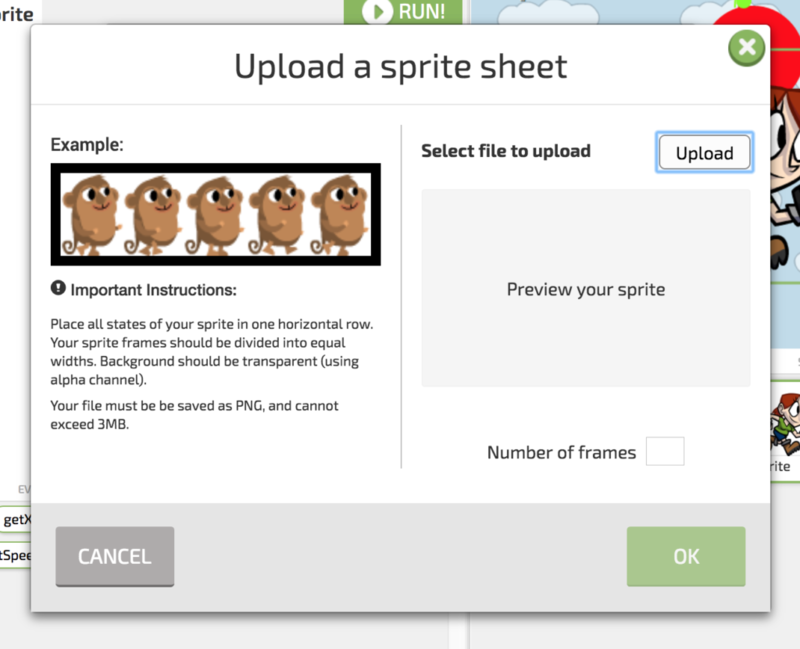 Click on “upload sprite sheet” and then on “upload” to select the file you wish to add. In the meantime, search for a sprite sheet that you wish to use in your game and then upload it. If you wish to use such a sprite sheet, then enter the number of frames in Number of frames. Since in this specific sprite sheet the girl is seen running in 6 different actions (or frames, I entered 6..
Click on OK, and your sprite will be added. To program or command your sprite, you first need to define the animation. To do so, click on addAnimation under Display on the bottom of the screen. As seen in Image 2, go to the Game tab on the lower right side of the screen and then click on Upload to choose a new game background. 3. Improved User Interface for selecting game background. After creating your game, don’t forget to save it before you share! I have tried and it works good over @addanimation. The picture however needs to be preconfigured before uploading. It would be better if I can configure the size. And it will be great if we can also add animation for the game background. That’s great to hear! I will see if we can add such a feature. What do you mean by being able to add animation for the game background? Perhaps something like this?